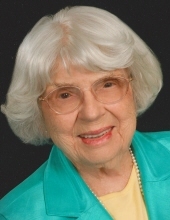 Nina Sandlin Hanggi of Ponca City passed away Tuesday morning, January 22. She was 95. Born September 12, 1923 in Ola Arkansas, she graduated Ola High School as senior class president and then attended Arkansas Tech where she met her future husband George Hanggi. Following his induction into the Army, George and Nina were married on August 3, 1944 in Columbia, South Carolina - just prior to his deployment to Europe. Nina worked for Federal Office of Price Administration (ration stamps) in Little Rock, Arkansas from July 1943 through January 1946, when George returned from World War II. After the war, Nina and George moved to Stillwater, Oklahoma where she attended Oklahoma A & M, graduating in May 1951 with a Bachelor of Arts degree in Language Arts, graduating Phi Kappa Phi. Moving to Ponca City in 1951, George worked as a Research Engineer for Conoco. In spring 1972, Nina completed the requirements for the Oklahoma Teacher’s certificate in Language Arts and Social Studies and served as a Substitute Teacher and Teacher’s Assistant in Learning Disabilities until retiring in 1985 and began traveling the world with George. Nina was very active in the Scouting program serving as Den Mother for the Cub Scouts and then supporting Troop 5 at St. Mary’s Catholic Church. All three sons and all three grandsons earned the rank of Eagle. Nina and George were very active in the Oklahoma Archaeological Society participating in many “digs” with the OU Archaeological College and was awarded the Golden Trowel for her contributions. She was a longtime member of the American Legion Auxiliary as well as the VFW Auxiliary and the Society of the Big Red One. Nina was preceded in death by her husband of 73 years, George, her parents, Roddy Forrest and Ellen Dale Sandlin, a newborn daughter, her son, Gerry Hanggi and daughter-in-law, Mary O’Meilia Hanggi, her brothers, Delmas Sandlin, Dale Sandlin, Jacoway Sandlin and William Sandlin. She is survived by her son, John Hanggi and his wife Kristin of Marietta, GA; her son James and his wife Kris of Manassas Park, VA; five grandchildren, Jason, Michael and his wife Bailey; Susan; Tammy and David, step granddaughter Michele Harris and her husband Brent and their children Wesley and Reynolds, Nieces, Diann and husband Richard Nicolai, Becca and husband Brad Blaisdell, Phyliss and husband Greg Heath, Mary Ann Sandlin Weisinger, Mae Dale Sandlin Sigrist, Jack Sandlin and his wife Ev, Jake Sandlin and his wife Terry. A rosary wake service will be held on Sunday, January 27, 2019 at 6:00pm at Trout Funeral Home Chapel. A Mass of Christian Burial will be held on Monday, January 28, 2019 at 10:00am at St. Mary’s Catholic Church in Ponca City. Following the ceremony, Nina will be laid to rest next to her husband at St. Mary's Cemetery. Casket bearers will be: Jason Hanggi, Michael Hanggi, David Hanggi, Tammy Hanggi, Susan Hanggi, Bailey Hurst-Hanggi, Brent Harris, and Michele Harris. Honorary casket bearers will be J. L. Brandon. The family wishes to express their appreciation to the staff of Via Christi Village for the wonderful care and caring they provided to Nina for the past two years. Nina will be remembered for her love of life, love, and adventure which she could always find in people, a trip to another country, or a simple outing in Ponca City. To send flowers or a remembrance gift to the family of Nina Hanggi, please visit our Tribute Store. "Email Address" would like to share the life celebration of Nina Hanggi. Click on the "link" to go to share a favorite memory or leave a condolence message for the family.